My oldest started middle school this week. In preparation of this momentous occasion, I watched Diary of a Wimpy Kid over and over. Its contemporary portrayal of the middle school years, and how the parents survive them, is all I’ve got to go on! Maybe there are others who have gone before me who can share their wisdom. Yes, other parents who can tell me how to prepare, survive, and thrive during this pubescent cocktail called middle school. And there are! 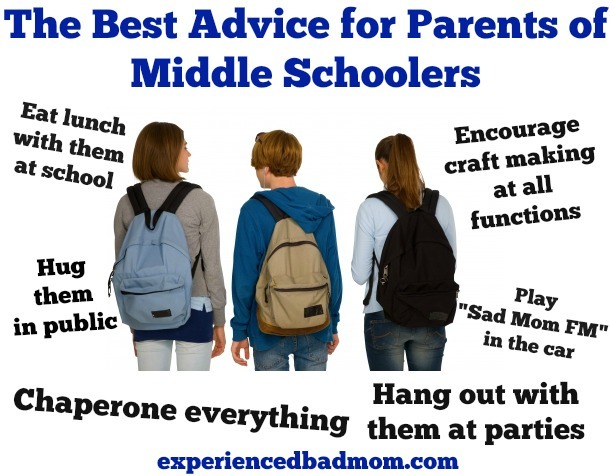 Below I share their best advice for parents of tweens and middle schoolers. Chauffeuring on the field trip: Be sure to tune radio to Sad Mom FM. Play the music really loud and be sure to sing along. Encourage everyone to join you. Also insist that everyone remove their earbuds so they can be fully involved in your musical journey. Volunteer for Chaperoning at the school dances: My two loved this! They really encouraged me to sign up. I guess the visions of me potentially ushering them over to a fellow classmate for a dance really got them going. In fact volunteer for Everything. I mean everything. Make sure you show up to their school at least once or twice a day. They really like that. “Your mom’s here. Again.” just sends them spinning down the halls deliriously joyful and carefree. On the off chance that they choose to have the party at your house be sure to greet each and every guest at the door. Hang about and help with coats. Be sure to stress that you are but a floor away should anyone need anything. OH Better yet STAY. And hang with them. They love that! They also love engaging in chitchat with you. Especially about how you couldn’t find smarties with a Christmas theme so you got 1/2 price Hallowe’en ones instead. Wise words indeed. Thanks for the advice Lisa and Kelly! I feel more sane and more able to conquer the years ahead. And with grace, wisdom and a sense of humor, I hope we all come out of it just fine. What is your favorite advice from Lisa or Kelly? Do you have any advice for me? Don’t forget to the follow the Dose Girls on Twitter, Facebook or Pinterest or Kelly on Twitter or Facebook. They are awesome! Aw Katy! Thank you! I almost wish I was back in the Middle School years. Almost. Looking forward to reading about your adventures in this land. Enjoy. I suspect you’ll have lots of material for brilliant posts. I ‘ll share this one far and wide. Thank you! See…here’s where I’m torn. My daughter really does want me to come eat lunch with her. But I don’ want other kids making fun of her for it. I don’t know what to do!! And I am especially worried because her birthday is next month. can I still make her cupcakes for school?!?! Oh, wow. I must defer to the experts! Hope they weigh in. My two cents? You are lucky to have a girl first. I think she’d probably love your visit. Brilliant advice from two of my very favorite blog gals! My piece of advice would be to not take the mood swings personally. The middle school years are as tough for your kids as they are for you. Maybe worse. I would NEVER want to repeat that part of my life! I’m going to come back and read your comment in the coming months when I bear the brunt of those mood swings! Thanks for coming by — Kelly and the Dose Girls always make me smile! Oh, man. It’s coming in a couple years. I have to save this one for reference. So not ready! I’ve never even watched Diary of a Wimpy Kid. I guess I have homework to do! I think your boys might like the DIary movies. Heck, this 40-something mom likes the Diary movies!